While passion and child care experience are musts when opening a daycare, it cannot be overlooked that child care and daycare centers need a solid business plan. Therefore, the opening of your daycare center must be approached with a careful strategy in place to ensure success in the early make or break years. This combination of a clear mission and a carefully constructed business plan will greatly increase the success of your child care business. At Procare, we want to encourage and enable child care professionals with all of the tools they need to enrich the lives of their students. That is why we have created this outline of important business needs to consider when starting a daycare center. The following information will provide aspiring daycare owners with direction throughout this challenging process. Starting a business, especially one as demanding as child care, is a huge time and financial commitment. It’s a good idea to examine the reasons driving your decision to open a daycare center, or “your big why.” Make sure you have a clear understanding of the time you will be required to devote before and after opening. You should also consider your previous child care experience. If you have been in this field for years and know it is what you want, then you can move on to the business planning stage. However, if you have relatively little experience in the field, it might be prudent to gain more experience at an independently owned center or even franchise. Think about why you want to open a daycare and the specific attributes that make you uniquely qualified for this filed. Once you are committed to opening your own daycare center, you will have to do research to determine how competitive a marketplace your community currently is, and how sustainable an environment it will be for your business in the future. What kind of center are they? What age groups do they accept? Another good indicator of the need in your community is whether these child care centers have waiting lists. This information can help you determine if there is enough demand in your community to open you center there. Another research strategy is to look at the current demographics in your neighborhood. If there are a lot of young families or newlyweds, this indicates that there will continue to be a need for your services in the future. Once you are familiar with the current child care landscape in your community, you have to think about how you will differentiate your program to fill a need not currently being addressed. Look at the hours of operations for the other centers in your community. Perhaps there is a timeframe early in the morning or late in the evening during which these centers are not open. Filling this need could make your center a valuable resource for parents. Additionally, if there is an age group that is not being served, such as daycare for infants (newborns to a year) or after school programs, your center could establish a foothold by filling these needs. Bonus Tip: Talk to parents in your community to find out what they need most from a daycare, and aim to address these needs at your center. Once you have done this initial research into whether your daycare business will be viable in your community, you have to begin compiling a comprehensive business plan that maps out your objectives and the strategies by which you will bring them about. Bonus Tip: As you go through creating your business plan, it is a good idea to mark down important deadlines and milestones on a calendar. This will ensure you have an accurate timeline for how long planning and preparations will take, and a strong estimate for when your business will be able to open. There are many legal regulations to consider when opening your center. License requirements are typically determined by states, and therefore will vary based upon where you live. You will have to make sure your business is in compliance with these regulations by acquiring the proper licenses. Child Care Aware offers a licensing resource that directs you to the proper licensing authorities by state. It is important to note that child care licenses and business licenses are not the same. You will likely have to acquire separate business licenses and child care licenses to legally operate your business. Starting a business is financially demanding. For your endeavor to be successful, it is essential that you accurately assess how much it will cost for you to open the center, determine where that money will come from, and then budget and plan to ensure your financial structure will sustain your business as it gets off the ground. During this process, you should consider initial expenses, and how much it will cost to run your business on an annual and monthly basis. Consider how much you will pay your daycare staff, what your tuition structure will be for parents, how late fees will factor in, and how much property rent / cost is in your community. It is important that you don’t begin the business process until you know how it will be paid for. This is money can be accrued from a variety of sources including your personal savings, loans from friends, loans from the bank, government programs, or grants. It is important that you keep track of your expenses and cash flow for multiple reasons. First, it will help you to track and pay back any loans in accordance with the agreement you made with the lending party. Second, tracking cash flow ensures that you don’t overspend, or create a payment structure that will jeopardize the financial stability of your business on a month-to-month basis. To be aware of when money comes into and leaves your center monthly, you should be tracking: the number of tuition payments you get per month, how many times a month your center pays employees, how many enrolled children you are permitted to have, and how many of those slots will be filled. Bonus Tip: Doing these calculations by hand leaves room for error, so we recommend a child care accounting solution that will track financial information for the center and the families you serve, as well as tracking bookkeeping, tuition payments, and cash flow. The first thing to determine when choosing a location for your daycare center is if you want to run the center from your own home, or in a commercial space. This will affect your expenses and licensing requirements. 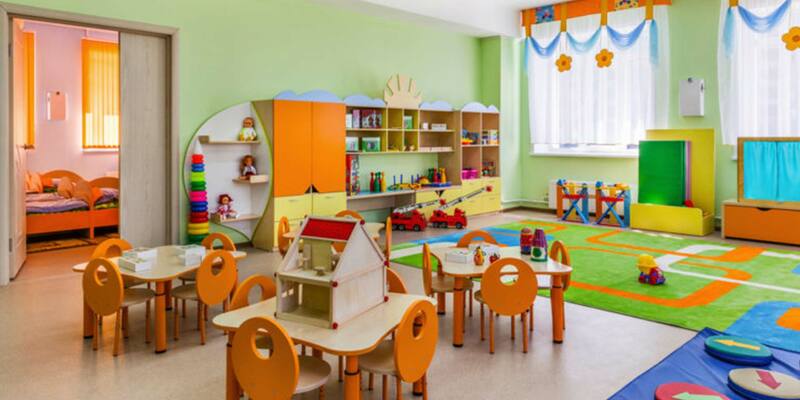 The location of your daycare center will be subject to many licensing regulations, including building safety, zoning, physical space requirements, emergency preparedness, and more. Many of these are to ensure that the environment in which you run you center is healthy and secure. This includes things like proper waste removal and having fire alarms. Two important location licensing requirements to keep in mind are zoning and physical space requirements. Zoning refers to a permit from the proper authority that allows you to run a business, or be zoned for business. The physical space regulation refers to the requirement that child care centers must have 25 square feet available per student. Therefore, you have to keep in mind that the size of your space will determine how many students are allowed to enroll. For parents to feel comfortable leaving their children at your center and confident that they will get the developmental stimulation they need, you staff has to be well trained and experienced. Additionally, you must have enough instructors to provide quality group and individual care, as well as meet ratio requirements. The student-to-teacher ratio refers to the number of instructors that must be present based on the number of and age of the students. The National Association for the Education of Young Children provides recommended ratios based on age and group sizes. Professional certification requirements and licenses vary by state; however, child care providers are often expected to have a high school degree or secondary degree. Common certification requirements are the Child Care Professional certification and the Child Development Associate certification. These require a certain number of hours of experience in different child care fields. You should also make sure that your staff has training in safety courses such as CPR and first aid, as well as how to asses and document child development to report to parents. Child care instructors can provide important information to parents about where their children are developmentally, and where they may need individualized attention. That is why it is important to have reporting and parent engagement processes defined at your center, to simplify communication between caretakers and parents. Bonus Tip: The interview and review process to find the perfect candidates for your center can be time consuming, so you will want to start the hiring process at least two months prior to the opening of your center. With financing, licensing, location, and staffing researched and prepared, you are almost ready to open your child care center. Final steps will be getting the necessary equipment and supplies, and setting an agenda for your daycare programs. You will need kid sized tables, furniture, and cots, as well as toys, crafts, and games. You will also need cleaning and administrative supplies. When setting the agenda for your program you will want to establish routine daycare schedules for each age group. These schedules should incorporate activities that promote early child care development in major areas such as cognitive, emotional, and physical development. As you get to know your students better, you will be able to cater the activities and learning programs to their specific interests. The processes and planning that go into starting a daycare center can be overwhelming. However, with a defined mission and strategic business plan in place, it can be a successful and worthwhile endeavor. Following the guidelines above will give you the structure you need to build a thriving daycare center with an environment that fosters healthy, happy kids. Looking for ways to automate and organize administrative and business functions at your daycare center? Learn how Procare can help!